2. Kim B et al. Personalized Med Onc 2013; 2:68-76. CancerTYPE ID is indicated for use in tumor specimens from patients diagnosed with malignant disease and is intended to aid in the classification of the tissue of origin and tumor subtype in conjunction with standard clinical and pathological assessment by a qualified physician. 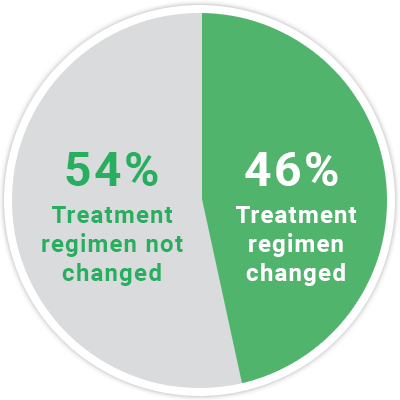 CancerTYPE ID is not intended to predict patient survival benefit, treatment efficacy or to distinguish between benign versus malignant lesions. 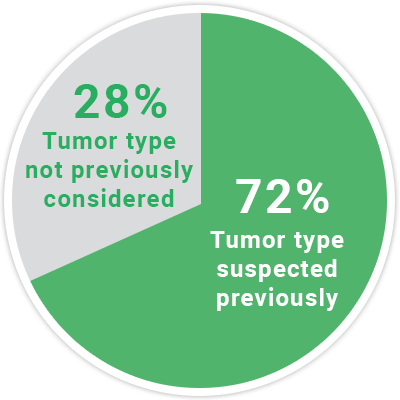 Tumor types not included in the CancerTYPE ID reference database may exhibit RNA expression patterns that are similar to RNA expression patterns within the reference database. This test was developed and performance characteristics have been determined by Biotheranostics, Inc. It has not been cleared or approved by the U.S. Food and Drug Administration. This test is used for clinical purposes. It should not be regarded as investigational or for research. How this information is used to guide patient care is the responsibility of the physician. Biotheranostics is certified under the Clinical Laboratory Improvement Amendments of 1988 as qualified to perform high-complexity clinical laboratory testing. © 2018 Biotheranostics, Inc. CancerTYPE ID is a registered trademark of Biotheranostics, Inc. All other registered trademarks or trademarks are property of their respective owners.